Step 1 Stir together frozen blueberries and jam sugar in a pot. Rinse and chop figs. Add figs and orange zest to the pot. Cook marmalade according to the directions on the package. Step 2 Chop chicken breast into bite-sized chunks. Stir together Tandoori Tikka and yoghurt. Mix in chicken chunks. Cover and let marinate for at least one hour. Step 3 Heat vegetable oil in a coated pan. Drain marinade from chicken and cook in hot oil for 5-6 minutes. Salt chicken and place on the wooden pieces. Step 4 Put lentils into a small pot and add water. Cover pot and boil for 3-4 minutes until lentils are soft. Add marmalade and stir. Season with salt and pepper. Rinse coriander, pick the leaves from stem, mince and stir into sauce. 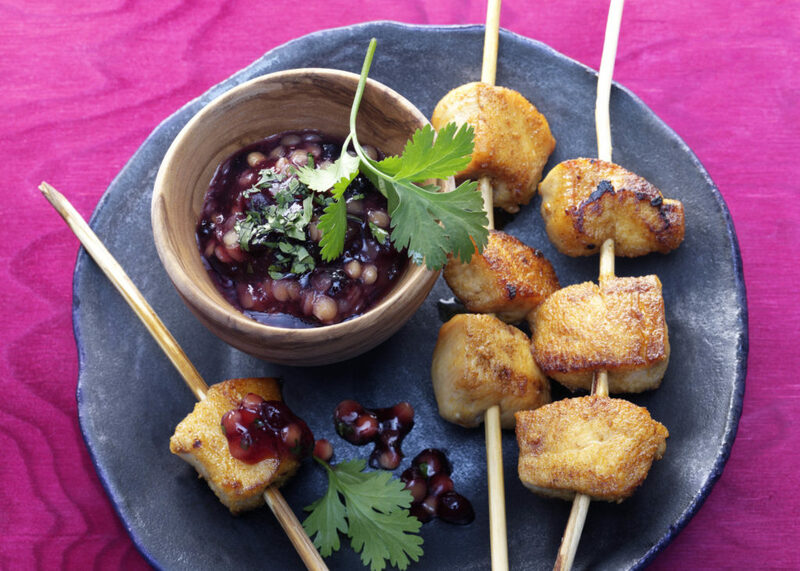 Skewer chicken chunks and combine with lentil blueberry sauce. Combine traditional Indian flavours with refreshing wild blueberries to create this unique dish.